TIR ubiquitin ligase with auxin (green). Plants, like animals, have hormones that deliver chemical messages between distant cells. Charles Darwin and his son discovered this over a century ago--they noticed that if they shined a light on the tips of grass shoots, the stems bend to bring the entire shoot towards the light. Somehow, a message was being sent from the tip down to the stem. You might also have observed the action of hormonal signals in plants: when you prune a tree to make it more bushy, you are modifying the traffic of plant hormones. Both of these effects are caused by the phytohormone auxin. Auxin is made by cells in the tips of plants, and then it is transported throughout the rest of the plant. It is essential for life of the plant, and the plant quickly dies if deprived of it. Auxin controls many functions, including proper patterning of leaves on stems and response to light and gravity. For instance, auxin controls the branching of plants. When you cut off the tip of a growing plant, you remove the major source of auxin, and the resulting lower levels of auxin cause the remaining parts to branch out instead of growing straight up. The ultimate effect of auxin is to regulate a collection of genes involved in cell division, elongation and differentiation. However, auxin does not appear to act directly on repressors or activators of these genes--it uses a more circuitous mechanism. Instead, auxin binds to a class of ubiquitin ligases, such as the TIR1 ubiquitin ligase shown here from PDB entry 2p1p . These enzymes assist with the destruction of proteins by the ubiquitin/proteasome system. Auxin binds to the ligase and promotes the ubiquitination of a series of regulatory proteins, termed Aux/IAA proteins. When these are destroyed, they allow a series of auxin response factors (ARF) to interact directly with the genes. Auxin is used in commercial horticulture to modify plant growth. The major auxin, IAA, is not stable enough for commercial use, but there are many other variants that are effective substitutes. For instance, synthetic auxins may be sprayed on fruit trees to delay the dropping of fruit, resulting in larger and sweeter fruit. When used in large quantities, synthetic auxins are effective herbicides, killing primarily broad-leaved plants but having less effect on grasses. In this way, they are used to kill weeds in cereal crops, sugarcane and lawns. Two synthetic auxins, together nicknamed Agent Orange, were used during the Vietnam War in massive defoliation efforts. Dioxin, an impurity in this herbicide, has been implicated in the health problems of Vietnam veterans. 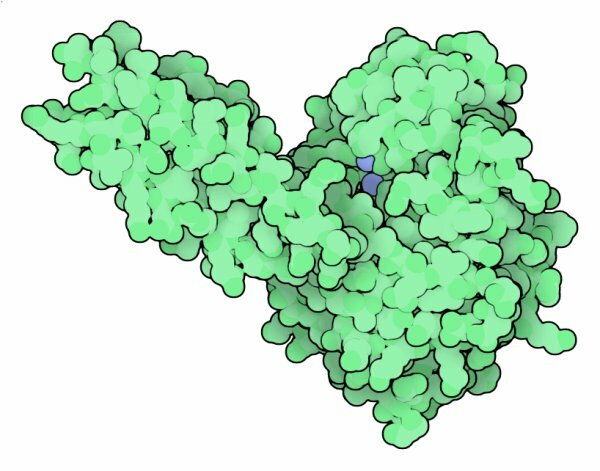 You can explore the recognition of the natural auxin IAA and one of these synthetic auxin compounds at Proteopedia. Auxin levels are closely regulated inside plants, since it plays so many important roles. One way that plants control auxin levels is to store the molecule in an inactive form until it is needed. Auxin is typically attached to an amino acid or a sugar, then it may be quickly clipped off when the auxin is needed. The enzyme shown here, from PDB entry 1xmb , is a auxin-conjugate amidohydrolase that clips off alanine amino acids attached to auxin. The active site is found in the deep groove shown at the top. It probably uses two metal ions in the reaction, which may be bound in the location of two water molecules (in blue) seen in this structure. The structure of auxin bound to the ubiquitin ligase revealed other surprises. Auxin promotes the binding of Aux/IAA proteins to the ligase, leading to their destruction, but it doesn't do this by changing the shapes of the proteins. Instead, it acts as molecular glue that bridges the two molecules. Auxin binds in a deep pocket in ubiquitin ligase, filling in a hole and creating a surface that perfectly matches the Aux/IAA protein. 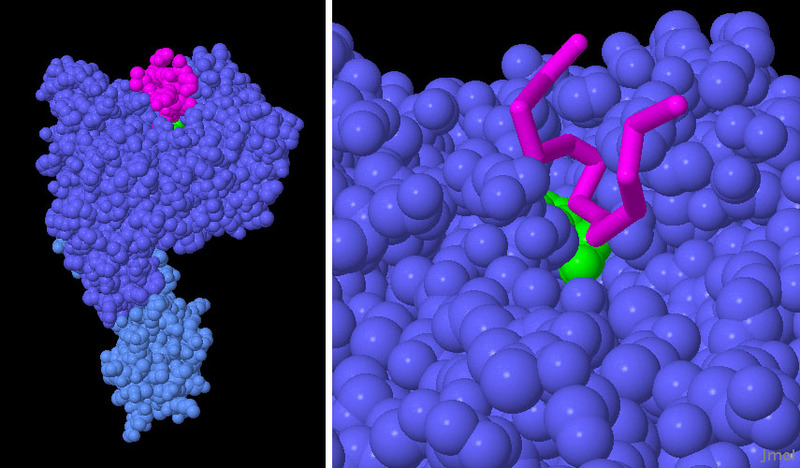 In this structure, from PDB entry 2p1q , auxin (in green) is bound to the ligase (in blue), and a short peptide from Aux/IAA (in magenta) is layered on top of the complex. Auxin is composed of an acidic group and an aromatic indole ring. How are these chemical groups recognized by the active site of TIR1 ubiquitin ligase? 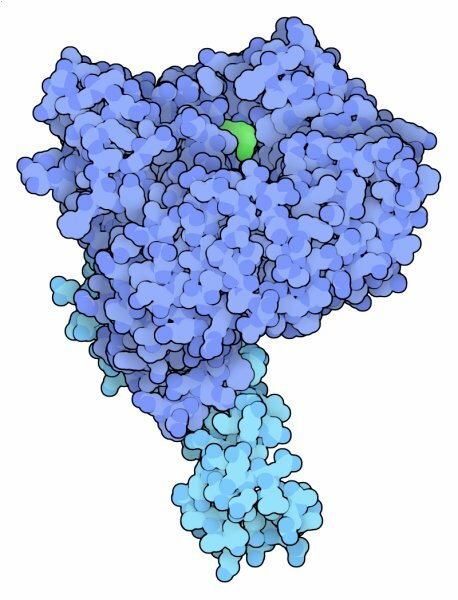 Structures of auxin-binding protein 1, a protein that also binds tightly to auxin, are available in the PDB. Does it use a similar collection of amino acids to recognize auxin in its binding site? K. Mockaitis and M. Estelle (2008) Auxin receptors and plant development: a new signaling paradigm. Annual Review of Cell and Developmental Biology 24, 55-80. C. Perrot-Rechenmann and R. M. Napier (2005) Auxins. Vitamins and Hormones 72, 203-233. H.W. Heldt (1997) Plant biochemistry and molecular biology. Oxford University Press.